Hamideh Khanum Javanshir grew up in a traditional Azerbaijani society where women were relegated to playing a self-effacing and submissive role with no identity of their own and no function in society outside the home and family. In 1907, she married Mirza Jalil Mamadqulizadeh founder and editor of the satirical journal Molla Nasreddin, which, through cartoons and articles, exposed injustice, superstition, abuse, and backwardness. The journal became tremendously influential throughout the Caucasus, Middle East, and Iran. Hamideh Khanum and Mirza Jalil’s marriage was a union of like-minded spirits, for they both wanted to educate their community in a period of great turmoil not only in Russia and Azerbaijan but also in Iran, where they had fled for a period. Awake is the story of their twenty-five-year struggle to be able to continue the publication of the journal and Hamideh Khanum’s tireless efforts to improve the lives of peasants in her village, where she introduced modern farming techniques and medicine. She established a school for girls and a weaving factory in the hope of achieving equal rights for the men and women of the village. 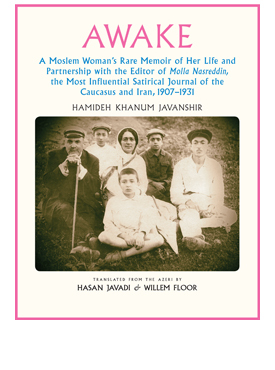 This book intertwines Hamideh Khanum’s memoirs with examples of the satirical cartoons that appeared in the journal as well as family photos and correspondences. It also has a number of appendices that include Hamideh Khanum’s paper on stopping the locust invasion, as well as essays giving the reader a better understanding of the environment in which the journal was published and the cartoonists and writers that contributed to it. The name of the satirical journal Molla Nasreddin is based on the thirteenth-century Iranian populist philosopher and wise-fool, known from Turkey to China for his pithy folk stories and anecdotes. He would often appear in the cartoons of the journal as one of the characters—observing, admonishing, and advising. Hasan Javadi was born in Tabriz, Iran to a distinguished family of administrators and scholars. He has taught English and Persian literature at the University of Cambridge, Tehran University and the University of California at Berkeley. He is the author and translator of numerous books, including Satire in Persian Literature, and Persian Literary Influence on English Literature. For Mage he translated Obeyd-E Zakani: Ethics of the Aristocrats and Other Satirical Works. His translations include: Forough Farrokhzad’s Another Birth and Other Poems, and with Willem Floor, Abbas Qoli Aqa Bakikhanov’s The Heavenly Rose-Garden: A History of Shirvan & Daghestan; and Evliya Chelebi’s Travels in Iran and the Caucasus, 1647 and 1654. He edited Letters From Tabriz: The Russian Suppression of the Iranian Constitutional Movement. Now retired, Dr. Javadi lives in the Washington DC area, where he is working on original scholarship and translations of Persian literature. Willem Floor studied development economics and non-western sociology, as well as Persian, Arabic and Islamology from 1963-67 at the University of Utrecht (the Netherlands). He received his doctoral degree from the University of Leiden in 1971. Since 1983, Dr. Floor was employed by the World Bank as an energy specialist, however, after his retirement in 2002, he has dedicated his time to the study of the social and political history of Iran, and has published extensively throughout this time. His books include: Public Health in Qajar Iran, Agriculture in Qajar Iran, and The History of Theater in Iran, as well as, The Persian Gulf: A Political and Economic History of 5 Port Cities, 1500-1730, its second volume, Persian Gulf: The Rise of the Gulf Arabs, 1747-1792, third volume, The Rise and Fall of Bandar-e Lengeh, the fourth volume, Bandar Abbas: The Natural Gateway of Southeast Iran, and the fifth volume, The Persian Gulf: Links with the Hinterland Bushehr, Borazjan, Kazerun, Banu Ka’b, & Bandar Abbas, The Persian Gulf: The Hula Arabs of The Shibkuh Coast of Iran, and The Persian Gulf: Dutch-Omani Relations A Commercial & Political History 1651-1806, and The Persian Gulf: Muscat – City, Society and Trade . He has also published, Travels Through Northern Persia, 1770-1774, Titles and Emoluments in Safavid Iran, and A Social History of Sexual Relations in Iran; Labor and Industry in Iran, 1850-1941; Guilds, Merchants and Ulama in 19th Century Iran; The Rise and Fall of Nader Shah; Games Persians Play, and History of Bread in Iran. His translations include: Samuel Gottlieb Gmelin’s Travels Through Northern Persia 1770–1774 , and with Hasan Javadi, Abbas Qoli Aqa Bakikhanov’s The Heavenly Rose-Garden: A History of Shirvan & Daghestan; Evliya Chelebi’s Travels in Iran and the Caucasus, 1647 and 1654; A Man of Two Worlds: Pedros Bedik in Iran, 1670–1675, and Wake Up Call: Memoirs of a Moslem Woman’s Struggle to Educate Her People, 1907-1931.